As standardized testing season begins each spring, we can perform a major service for our students by sharing the following four keys to success. Taken together, these tips comprise an effective mental approach to test-taking that values strong focus, thoroughness, and carefulness. 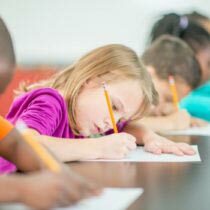 Children need to understand that how they go about completing the test questions has a tremendous effect on their scores. Review these tips with your students in the days and weeks leading up to your state’s standardized testing, and you will notice a significant improvement in the way your students approach the test-taking experience. Treat every question as the most important one. Pay incredible attention to detail. Check your work carefully at the end. Let’s analyze each of these tips individually. It is natural for children to feel nervous or doubt themselves as they begin a testing session, and I want the first tip to settle them down, put them in a positive frame of mind, and build their confidence. I also make the point that they should feel confident thoughout the testing session and not get down on themselves if they become a stuck on a question or two. As in sports, the goal is to keep an emotional “even keel” the entire time. We don’t want to get too high when things are going well or too low if we encounter a difficult stretch of the test. The only question we have control over is the one on which we are currently working. One of the worst things that can happen on a test is to become so frustrated over one question that we let that emotion carry over to the next couple questions. Encouraging kids to treat each question as the most important one helps them lock in on each individual question without regard for how we feel we did on the previous question. I have found that the phrase “incredible attention to detail” resonates with kids and prevents them from missing questions because they glossed over one of the words in the directions or didn’t give full consideration to each answer choice. Every year when I ask my students which of the tips they find to be the most helpful, this one usually comes out on top. Most children tend to close their booklets after completing the final question and take out a book to read until the end of the testing session. I teach my students to take a short break after finishing the last question and then look through each page of that day’s section as if they have never seen it before. This is a big challenge for most kids because either they are tired from completing the section or they genuinely believe that they don’t need to check their work again. Once students buy into this approach, however, they rarely ever leave a question unanswered and frequently correct the mistakes they find. I am the English as a New Language (ENL) teacher at a middle school in Indianapolis, IN where our ENL students predominately speak Spanish and Punjabi. Not only do some of my middle school ENL students have difficulty with test-taking, but they first must translate what the test is saying into their native language and then comprehend it before they can think about test-taking strategies. I have found two additional test-taking strategies that work for my students. The first is used for reading comprehension questions; the key is use for the students to use different colored highlighters for each question. They highlight the key words in question 1 in let’s say pink, and then as they are reading and looking for the answer to question #1, they highlight the answer to #1 in the reading in pink. This gives a visual to “proving that your answer is correct because you found it in the text.” The second strategy I have taught my students is for multiple choice questions. After they have read, reread, and read the question again, as they read the 4 answer options, they are to say, “yes, no, or maybe” and put a check, an x, or a question mark next to each answer option as they go. This is a great strategy to use to eliminate wrong answers and narrow down and increase the probability of selecting the correct answer. Both my strong test takers and my not-so-good test takers have found this strategy to be quite helpful.